Tag line: "'Tis about to get medieval up in here"
I don’t know much about “LARPing” (aka “Live Action Role Playing”), and one of the most frustrating things about 2013’s Knights of Badassdom, which puts the focus squarely on LARPs and those who participate in such events , is it doesn’t teach me a whole lot about it, either. A diverting enough comedy that did manage to make me laugh, Knights of Badassdom nonetheless left me feeling like I’d turned up at a party I wasn’t invited to. Joe (Ryan Kwanten) an auto mechanic / musician, has just been dumped by the woman he loves. To take his mind off his troubles, Joe’s two friends Eric (Steve Zahn) and Hung (Peter Dinklage) drag him to their weekend LARP event. Though reluctant at first, Joe does eventually come around, and along with their teammates Gwen (Summer Glau) and her very competitive cousin Gunther (Brent Gipson), the three pals set off for what promises to be the adventure of a lifetime. Before they can begin, however, Eric is ordered by the event’s Game Master, Ronnie (Jimmi Simpson), to cast a spell over Joe to prepare him for what lies ahead. But when Eric uses an actual book of spells, one that dates back hundreds of years, he awakens a demon that’s hell-bent on spoiling all their fun. From the outset, Knights of Badassdom tosses us head-first into the world of LARPing with very little insight into what it is, or why it’s so popular in some circles. It’s not that LARPs are incredibly complex; before long, I had a general idea of what was happening (it helped that several characters compare LARPing to Dungeons and Dragons, calling it the “next logical step” for those who enjoy that game). But I still had questions the movie wasn’t answering, like how the “missions” are scored (prior to the big battle, each team was assigned a mission to complete). Also, Ronnie the Game Master is usually nearby to judge whether or not our heroes have remained on task, but if he’s following them, who’s watching the dozen or so other teams to make sure they, too, are following the rules? Does the team dressed up like sprites have a different type of “mission” than the group decked out in leather, carrying broad swords? Unlike most movies, Knights of Badassdom would have benefitted from a little more exposition. That said, there were things about the film I definitely enjoyed. For one, the animosity between the LARPers and the weekend paintball warriors made me chuckle (obviously, paintball battles rely as much on fantasy as live action role playing; yet while LARPing is seen as an activity for nerds, paintball is for “real men”. It’s like the guys who laugh at the “dorks” playing Dungeons and Dragons, then turn around and join a Fantasy Football league). On top of that, Steve Zahn gives his all as Eric, as does Jimmi Simpson, whose Ronnie the Game Master is, at times, hilariously intense (his sharp critique of the map his subordinates drew of the playing field made me smile, and would come back to haunt Ronnie at a key point in the film). On top of this, the CGI monster from hell that wreaks havoc towards the end of the movie looked pretty darn good, especially when you consider Knights of Badassdom didn’t have a Hollywood-sized budget behind it. 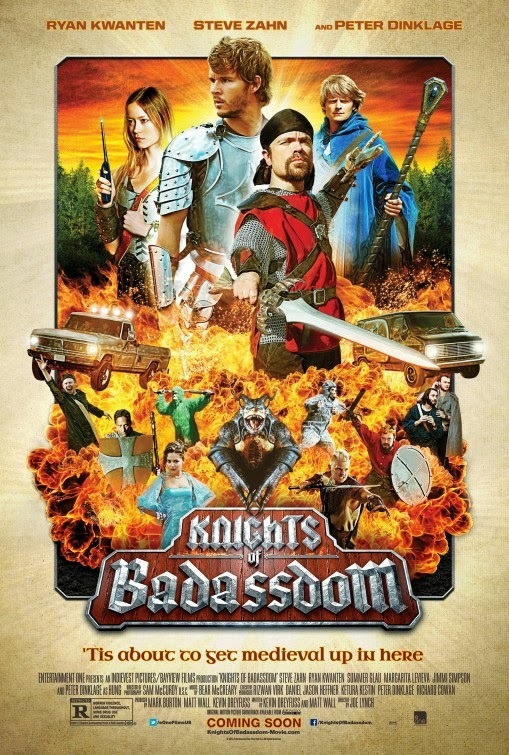 If you know a little something about Live Action Role Playing, then Knights of Badassdom is the movie for you. Everyone else would probably benefit from a quick Google search before venturing forward.